List of contributors; Preface; Dedications; Remembrances; Part I. Recognition, Diagnosis, and Impact of Nonepileptic Seizures: 1. Epidemiology and classification of nonepileptic seizures; 2. Psychogenic nonepileptic seizures – historical overview; 3. The costs and burden of psychogenic nonepileptic seizures in context: PNES and other conversion disorders; 4. Clinical features and the role of video-EEG monitoring of psychogenic nonepileptic seizures; 5. Comorbidity of epileptic and psychogenic nonepileptic seizures: diagnostic considerations; 6. Nonepileptic paroxysmal neurologic and cardiac events; 7. Parasomnias: interface with epileptic and nonepileptic seizures; 8. Hypnosis for psychogenic nonepileptic seizures and psychogenic movement disorders; 9. Using linguistic analysis to discriminate between patients with psychogenic nonepileptic seizures and patients with epilepsy; 10. 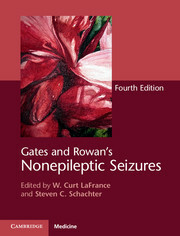 Diagnosis of nonepileptic seizures in children; 11. Diagnosis of nonepileptic seizures in the elderly; Part II. Nonepileptic Seizures: Culture, Cognition, and Personality Clusters: 12. Cultural aspects of psychogenic nonepileptic seizures; 13. Use of neuropsychological and personality testing to identify adults with psychogenic nonepileptic seizures; 14. Cognitive complaints, affect disturbances, and neuropsychological functioning in adults with psychogenic nonepileptic seizures; 15. Health related quality of life: utility and limitations in patients with psychogenic nonepileptic seizures; 16. Legal medicine considerations related to nonepileptic seizures; Part III. Psychiatric and Neuropsychological Considerations in Children and Adolescents with Psychogenic Nonepileptic Seizures: 17. Psychiatric features and management of children with psychogenic nonepileptic seizures; 18. Factors contributing to the onset of psychogenic nonepileptic seizures in children and adolescents; 19. Adolescents' and parents' perceptions of psychogenic nonepileptic seizures; 20. Factitious disorders; Part IV. Psychiatric and Neuropsychological Considerations in Adults with Psychogenic Nonepileptic Seizures: 21. Classification of nonepileptic seizures; 22. Post-traumatic stress disorder, abuse and trauma: relationships to psychogenic nonepileptic seizures; 23. Comorbidities in psychogenic nonepileptic seizures: depressive, anxiety, and personality disorders; Part V. Treatment Considerations for Psychogenic Nonepileptic Seizures: 24. Historical approaches to treatments for psychogenic nonepileptic seizures; 25. Managing psychogenic nonepileptic seizures in patients with comorbid epilepsy; 26. Models of care: nurses and social workers and their role in the management of patients with psychogenic nonepileptic seizures; 27. Who should treat psychogenic nonepileptic seizures? ; 28. Designing treatment plans based on the etiology of psychogenic nonepileptic seizures; 29. Cognitive behavioral based treatments for psychogenic nonepileptic seizures; 30. Family therapy for patients diagnosed with psychogenic nonepileptic seizures; 31. Group treatments for psychogenic nonepileptic seizures; 32. Pharmacological treatments for psychogenic nonepileptic seizures; 33. Training in treatment of psychogenic nonepileptic seizures; 34. The biology of psychogenic nonepileptic seizures; 35. Care models and coding for nonepileptic seizures; Appendix; Index.